The Museum of the History of Medicine (Musée d’Histoire de la Médecine) in Paris has collections dating back to the 18th century celebrating the evolution of medical instruments. The collections, with around 1,500 objects, are some of the oldest in Europe and are especially strong in medical instruments for surgery and physiology, although there are also anatomical specimens and art related to surgery. 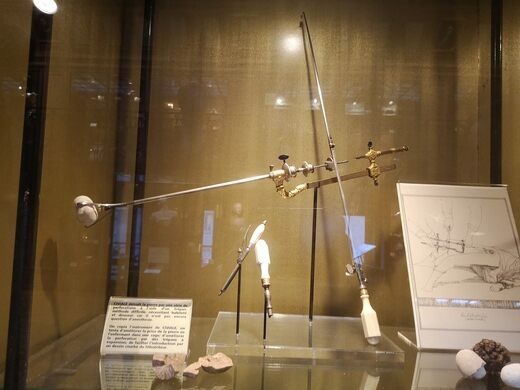 The exhibition in the museum is arranged chronologically to take visitors through the history of surgical devices, such as those for trepanning and even those surgical bags used at Waterloo (all of which will make you glad to live in the modern era of anesthesia and less menacing metal instruments). The prized objects include the autopsy tools used on Napoleon, and an intricate wood model dating to 1799 for anatomy study that has hundreds of movable parts. The museum is located in the Université Paris Descartes on the second floor in a beautiful space dating to 1905 and, after having undergone a restoration, is open to the public. Do be aware that the small entry fee of 4€ is payable by cash only. Statue of death tucked in the University of Medicine courtyard. A surrealist timepiece by the artist of melting clocks.